I was instantly drawn to Alicia's leather bracelets when I saw them on her Instagram. I shied away from purchasing Sylvan Park's bracelets, not because of their price, but because of their size - I wasn't sure the bracelets would fit my wrists. Lucky for me I found another brand, Nickel & Suede, that sold very similar bracelets in various sizes and for half the price - it was quite the win. 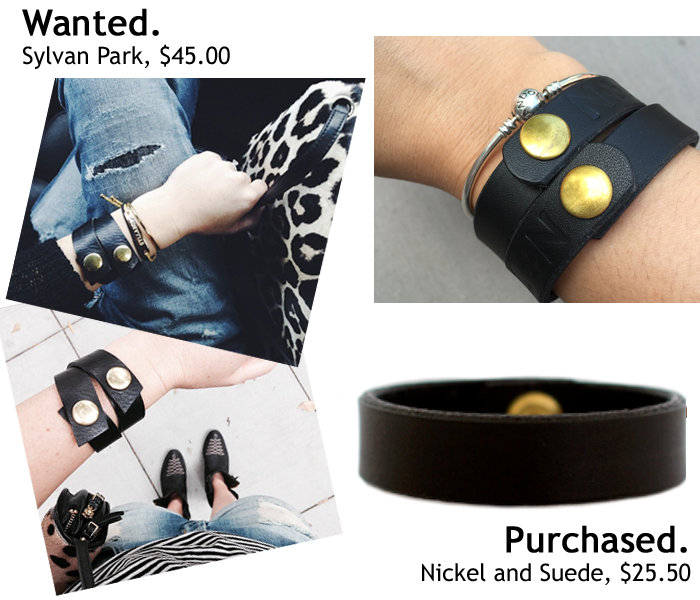 These bracelets are great because they really go with everything - it's hard to go wrong with black leather. I always aim to shop from independent designers, especially when purchasing jewelry, so I'm particularly happy to write about both of these shops. *Collage created by Gabriela Monsanto. Photographs taken from @alicialund.